But like playing partner Phil Mickelson, he failed to close the gap on Crane in a late afternoon start to his third round, covering his first nine holes in one over to slip to tied 16th on four under with Graeme McDowell level after 12 holes and tied 22nd on three under after previous rounds of 69 and 68. 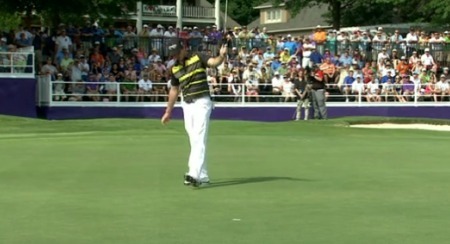 Battling blustery conditions on a soft course, Harrington had to hole a nine footer for par at the first and a four footer to avoid a three-putt at the second after powering his 12 foot birdie chance past the hole. A two-putt birdie from 35 feet at the third was positive but he hit his tee shot in the water at the par-three fourth and did well to limit the damage to a bogey by holing from 13 feet. Another shot went at the ninth when he found the left rough off the tee and put his second in the lake that guards the green before holing a five footer for his bogey. Mickelson, who is seeking his first Top-10 of the season on the US tour and a boost ahead of his bid to complete the career Grand Slam in the US Open at Pinehurst No 2 next week, made nine straight pars on the front nine.